Welcome to the ELTE-Soft website! 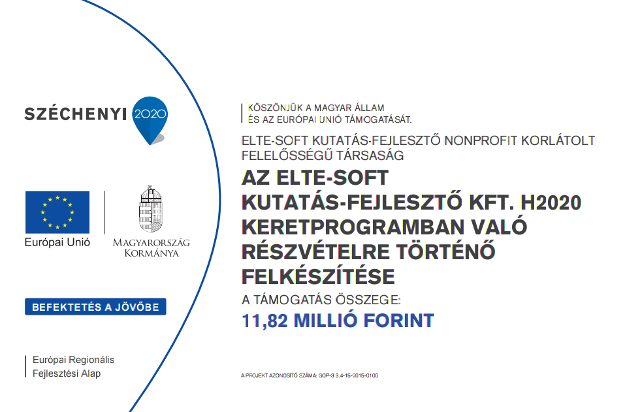 The mission of our company, ELTE-Soft is to support University Eötvös Loránd being the national research and training centre in ICT software technologies. realize beneficial and secure conditions for the two-directional flow of experts. In the forthcoming years the main task of the info-communication industry will be to ensure higher and higher levels of means and solutions for invigorating the flow of knowledge on particular scientific and innovation areas. And also, to dismantle the time and space barriers in the public ICT services. As an effect of the ICT’s development, further integration of scientific fields is expected, and, on the other hand, further decentralization of the research and development workplaces (by means of physical) will come. The ELTE, who is one of the leading universities of our country, has a notable number of teachers, trainers and students, who are continuously widening their up-to-date knowledge and experiences. The ELTE-Soft, being owned by ELTE, as a business company, has wide opportunity for cooperation in composition of professional project teams. That is why we bring the opportunity to build cooperation in the private sector and also in the governmental/public administration. Our teammates and co-workers with university degree in informatics have knowledge and expertise in analyzing and understanding of the difficult socio-economic processes, since their foundation for training was theoretical and applied mathematics. The professional staff of the University has been participated in industrial and public research activities since decades; and also take part in development tasks claiming high level expertise and experience. Results of our finished projects are built in the marketable products of our industrial partners. The vast number of high-level publications also prove the efficiency of our cooperation. Our activity is unfold in the form of business organization. This holds the advantage of quickly reacting to the market challenges and as we are a non-profit organization, this is paired with support of the long-time objectives of the University, in regards of teaching and training expertise.